This is one reason we're thinning our stand. Pine beetles kill trees in overstocked forests where trees are stressed by lack of water or nutrients. Drought and warmer winters, two symptoms of global warming, aggravate the bug problem because trees are less able to defend themselves. Dead trees are a fire risk. Thinning the forest to mimic fire ecology makes the remaining trees healthier and more resistant to bugs. Unfortunately for the trees shown here, we didn't get to them in time. A stand takes a few years to benefit from thinning. Bark beetles damage trees by tunneling between the bark and the cambium layer to lay eggs. In spring they bore into trees and emit pheromones that attract masses of additional bark beetles. Developing larvae continue tunneling as they feed. This damage under the bark prevents water and nutrient movement within the tree. 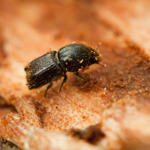 In addition, bark beetles carry a fungus that clogs the water transport system. All these factors pose a serious threat to the survival of pine trees. If you're here because your favorite pine is dying from beetles, I'm sorry. This is the sad reality of our time. In 12 years we have lost approximately 40 trees (on 20 acres) to this pest. In some years we lost one or two trees, while other years we lost as many as 10. Currently the parasite kills 2-4 trees per season, depending largely on how cold was the preceding the winter. Birds can detect the hatchlings under the bark and harvest them for food. As in one of the trees pictured here, the birds can strip the entire stem of its bark looking for larvae. In a way this woodpecker buffet is a positive outcome. Natural predators have consumed the bugs before they could fly to nearby trees and start the cycle again. Once the foliage shows signs of demise due to beetles, the bugs have left the tree and won't be back to that one.You can decide to remove killed trees to reduce fuel density, or leave some snags for habitat. 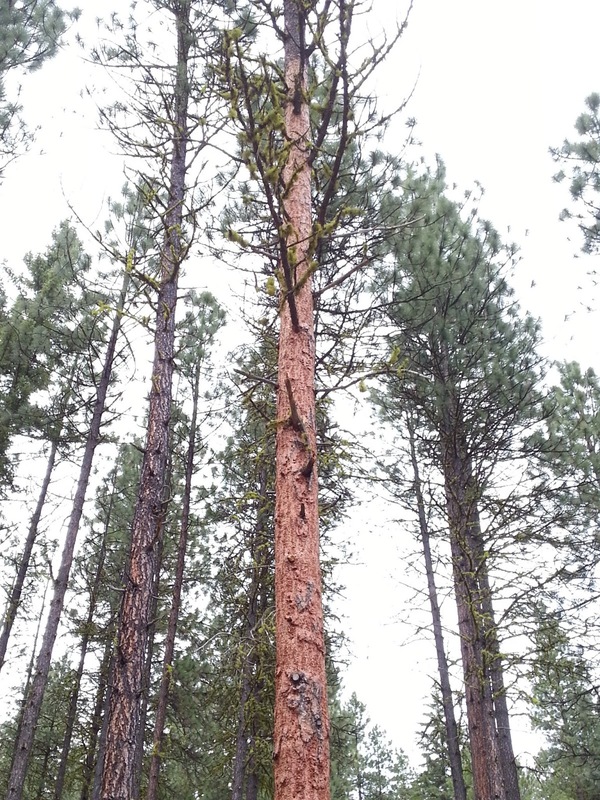 A Ponderosa pine will fall on its own just a few years after it dies, so consider your safety and property. brown bug body visible in the glob. Our bug-prevention strategy is to maintain vigorous, healthy stands of mature pine or mixed species. We avoid harvesting or pruning pine except in late summer. 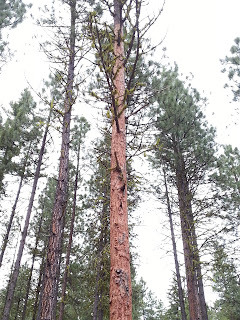 We enhance habitat for the pine beetle's natural enemies. Early indications are that this is successful. We have seen the bug-related mortality in thinned stands drop to zero or close to it after five years. Other than thinning, little can be done to prevent bugs from infesting a stand. An aggressive approach is to watch for pitch globules at bore hole sites and cut those pines immediately. Some experts advise bucking the logs to four foot lengths so the bole will dry quickly; others advise completely encasing the deck with black plastic for a year or more. Dry slash in the sun to reduce beetle breeding habitat. If creating pine slash in spring or fall, dispose of slash promptly if possible. All of these methods are labor intensive -- but if your stand is small, you might not be willing to wait and see how many trees are lost to pests. Technical advice is available for the asking through USFS, NRCS or DNR. You may very well qualify for a forest management grant to offset the costs. that are out of water balance. Until you can act to prevent beetle infestations, monitoring your casualties and understanding patterns is helpful. Watch for dying pines in spring or late fall. 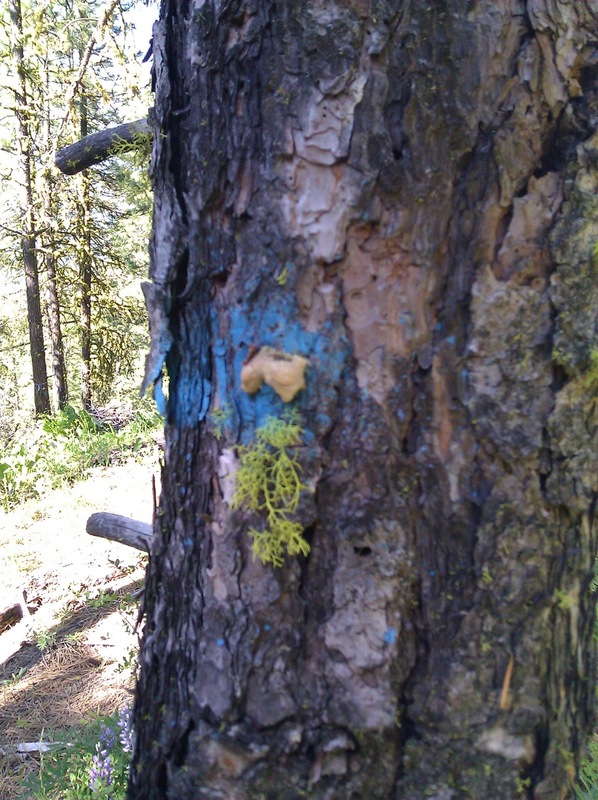 Look for pitch globules at bore hole sites on pines. Trapping can be useful for quantitative monitoring. Beetles are out there in the woods, everywhere in the Northwest, reproducing in the limbs and tops of trees. When forests are stressed, the bugs aim lower and girdle the weakest trees. They can and will eventually kill every tree in a distressed stand -- if a fire doesn't beat them to it. You can prevent the deadly attack of the bugs by thinning your trees and leaving the healthiest pines.